Music festival Coachella has recently wrapped up the second of its two long weekends. Taking advantage of the relatively warm climates of the Californian desert, the famous event jumpstarts the summer festival season. This year’s event has seen sponsors step up with innovative marketing ideas, whilst Coachella (itself a brand) has also provided a brilliant example of maximizing social media presence. Boasting an eclectic line up of artists over the two weekends – none of which are overtly commercial and many of which have gained popularity by the release of free music – bombarding festival goers with brand messaging and products with a lack of relevance to the surroundings could have backfired. It appears that this year’s sponsors were aware of this and delivered innovative solutions for their brands, enhancing consumers’ festival experience. Heineken launched its cold storage room, allowing Coachella attendees to store up to two cases of Heineken in their own personal coolers accessed via the owners’ thumbprints. Helping to avoid frequent queuing throughout the day and, worst of all, warm beers (the bane of a festival goer’s life!). Meanwhile several fashion brands, such as Lacoste and Guess, hosted after parties near the festival site, with an array of entertainment options, including performances from some artists featured at Coachella, to support the launch of new products. 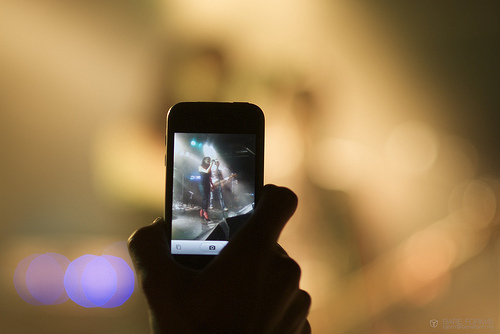 As mobile phones have become an increasingly popular replacement to a lighter in the air, illuminating the arena at the request of the artist, sponsoring a festival has become a logical choice for phone companies – particularly in light of research that suggests 66% of concert goers nowadays take pictures via their smartphones and about 32% send Facebook updates or tweets from a show. T-Mobile took advantage of this, bringing their ‘Neon Carnival’ to Coachella. This included carnival games and thrill rides such as bumper cars, an enormous Ferris wheel and a giant slide. Again, the reason for this event was the launch of a new product (new beats by Dre sound technology for the HTC one mobile phone) – however, it was placed in the context of a funfair, allowing those attending to receive a memorable, positive brand experience. In a bid for cultural relevance (topic discussed in my previous blog post) Hyundai presented their Re:Generation music documentary, placing artists from different genres together in creative collaboration. Hyundai’s Advertising Director David Matathia hopes this approach is a “more effective model that appeals to that audience more than pushing ad messages at them”. It would appear these brands have headed the warning of Scott Lucas, executive director of Interbrand Cincinnati, who advised “the experience needs to be carefully planned to ensure not just execution but relevancy”. 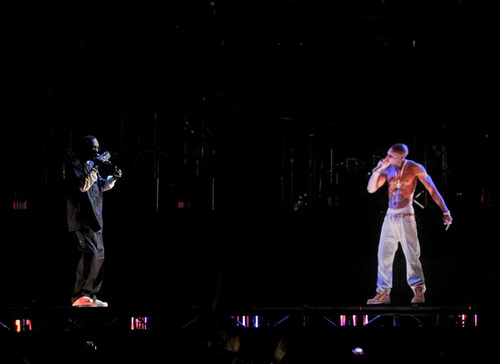 As for Coachella itself, the now infamous Tupac hologram generated a huge buzz across all social media platforms during the first weekend, as mentions of the hologram exceeded 2.3 million tweets during one evening alone. The festival’s embracement of viral output (the whole weekend was streamed live) and notable online presence helped it amplify the buzz. Through developing a YouTube channel, and Tumblr, Twitter and Pinterest accounts, the festival had a presence across 9 social media platforms. 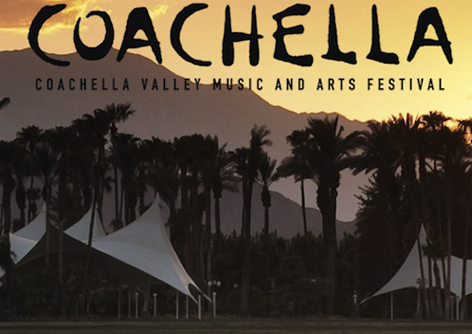 As a brand itself, Coachella has laid the blueprint for those in the consumer market to follow when thinking of creating consumer engagement, product content and generating buzz. The only difficult part is coming up with the creative idea to get people talking. At the end of the year, a lot of advertising and media professionals start to think about the year ahead and make their educated guesses about what the next big things will be. I’ve searched far and wide for all the predictions I could find, and picked out some that are interesting and important to anyone working in advertising. 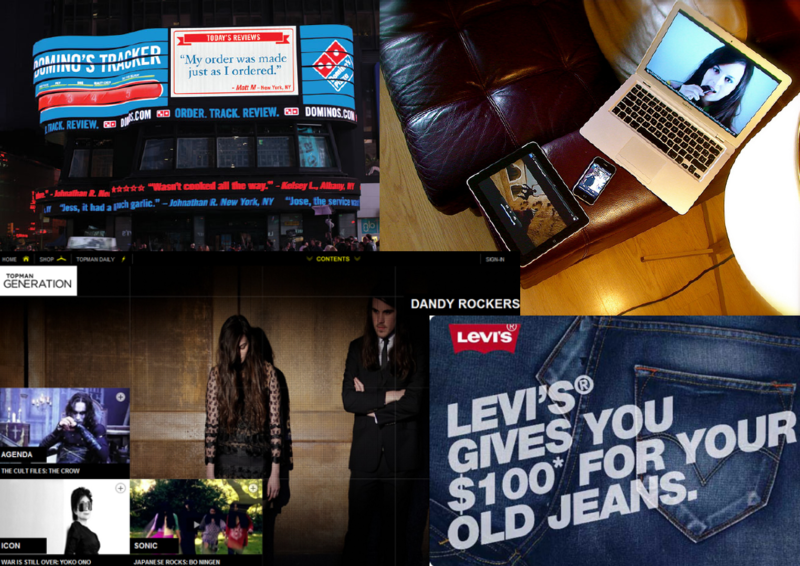 Mashable predicts that 2012 will be the year of interactive ‘second screen’ campaigns. A huge number of consumers are already using their mobiles and tablets while watching TV, and startups like Into Now and Shazam are busy creating platforms for engaging with the second screen audience. Pepsi, Gap and Starbucks have been some of the quickest advertisers to jump on board. They also predict that we will see a proliferation in cars being connected to the Internet, resulting in a rise in streaming music in the car instead of listening to the radio and “an Internet-powered overhaul” to radio advertising. One of Trendwatching’s 12 trends for 2012, ‘Flawsome’ (self-admittedly their “worst-named trend ever”), captures the idea that “to consumers, brands that behave more humanly, including exposing their flaws, will be awesome”. Signs of this trend include Domino’s use of a billboard advertising space in Times Square: they used the high-profile billboard to publish customer feedback given via Twitter – both the good and the bad. They also predict that in 2012, trading in will be the new buying as consumers hope to make an extra buck by reselling or trading their past purchases. SocialMediaExplorer writes about the importance of content as the role of brands becomes closer to that of publishers; no longer can brands get away with uninteresting or purely self-promotional website content or social media updates. For instance, a Facebook page for a brand targeted at stay-at-home mothers shouldn’t be managed by a middle-aged male marketing manager with no idea about the types of topics that that their audience wants to read about. Late 2011 already saw many brands investing in editorial talent that can capture their target audiences, for instance Topman hiring editorial staff from Dazed & Confused to launch its new multimedia magazine for fashion-conscious men. They also predict that 2012 will see marketers increasingly using influence ranking tools such as PeerIndex and Klout to seek out the individuals that are the most influential about their category and brand in social media. Many of the trends identified by JWT Intelligence have to do with how consumers and companies are dealing with the prolonged recession. They think brands will start creating more affordable alternatives for consumers, such as Heinz’s smaller 99cent ketchup in the US. On the other hand, consumers are starting to live a little and splurge once in a while despite financial worries and a low confidence in the economy. They also believe that as the content and experiences we are exposed to have become more personalized and narrow, a desire for experiences that are random and unexpected will emerge. These days, we’re never alone. Our social networks are constantly with us, just one tempting click away – the click that distracts us in meetings, entertains us in public transport, and has ruined many a date. The increasing presence of and access to our social networks is influencing how we buy and sell, and in this post I’ll be focusing on two fascinating developments in how we shop – asking for instant opinions while in store, and selling to our social networks online. We’ve always searched for opinions on decisions. Before, we asked friends or sales assistants – ignoring the feeling we had that they were probably either telling us what we wanted to hear (in the case of friends) or simply telling us to buy (sales assistants). Then, we started reading online reviews – what were meant to be honest opinions from strangers. These too are now taken with a pinch of salt as companies hire writers to create praising reviews for them for a few dollars apiece – necessitating the creation of a fake review detector earlier this year. There are signs that the next stage of asking opinions about purchases could lie in apps that enable people to pose questions to their friends, network and strangers immediately, while still in store. Opinionaided allows people to ask questions ranging from ‘Which shoes to buy?’ to ‘Should I dump my boyfriend?’ The answers will be immediate – and brutally honest. Honestly Now is a similar social game, but aimed at women aged 30 to 50, and focuses on personal decisions and tricky situations. Players can choose to keep questions private with friends, or share queries anonymously with all users. With both apps, key to getting users to trust the opinions is allowing them to rate others’ answers; those with stellar ratings get pro status – making it harder for companies to keep recommending buying their own products. The access we have to our social networks could also change the way we sell things. One of the first companies to offer any Facebook user who considers themselves a trendsetter the chance to curate their own boutiques online is Shopcade. Shopcade users will be able pick items from different brands based on their sense of style, and make money when their friends buy through them. Some forward-thinking brands are turning directly to social selling through social media. For instance, a newly launched jewellery brand Chloe + Isabel only sells their high-fashion accessories online through organically-growing networks of women – sold by a fashionable and tech-savvy version of Avon ladies. The company designs, produces, and markets fashion jewellery for interested sellers, who then create their own virtual boutiques selling the brand’s jewellery on a 30% commission. A sign of strong faith in the future of the business model is shown by the fact that the company has so far received over $10 million in venture capital. It’ll be interesting to watch these new behaviours emerge, and how brands will tap into them. 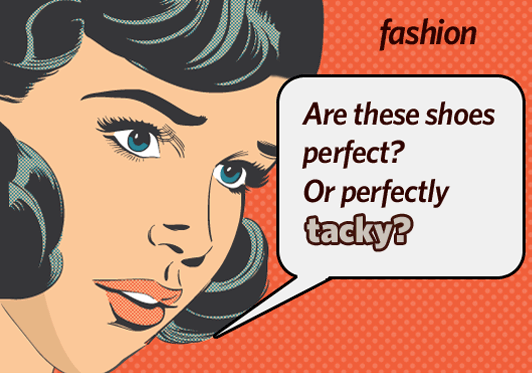 The desire for instant and honest feedback on purchase decisions won’t necessarily need to exclude brands – for instance, fashion brands could offer instant opinions from personal stylists, or team up with respected fashion bloggers to do this. Whether any big brands will experiment with social selling 2.0 will be interesting to see – the next stage of brand ambassadors could well be brand salesmen. Divided generations: what can generational theory teach us about advertising to the young and old? March Madness: inspiring cross-platform campaigns from the U.S.